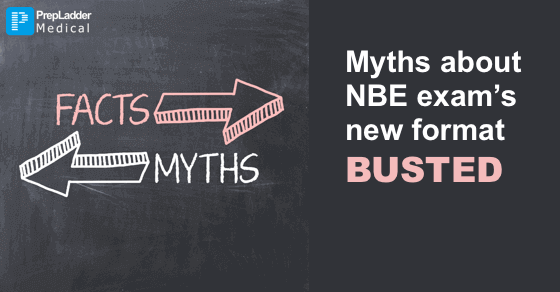 Myths about NBE Exam's new format, BUSTED!! As predicted by PrepLadder earlier, TCS is the most probable choice for conducting NEET PG and other NBE exams this year. To see the previous blog by PrepLadder accurately predicting this, click here. Sources close to NBE have quoted that they are planning to hire Tata Consultancy services as a technology partner for all its exams. However, no formal announcement has been made. A proper tender bidding process will be followed but there are high chances of TCS getting that tender but people inside Governing body has informally made up their minds for TCS. A formal notification is still awaited. Format of the exam: Many students are worried about the exam format changing. Even though the exam conducting company has changed, the exam format in terms of difficulty level, format of questions, number of image based questions etc will not change. Questions will still be in one liners format and factual based. *Note that many sources are spreading false info that exam will be based on AIIMS PG pattern. This is not true, NBE is still the conducting authority not AIIMS. So there will be no change in pattern/content of the exam. Negative marking: Since TCS software has no normalization, negative marking will be used in scoring process. Single day exam: All NBE exams will be single day exams now. Since there will be no normalization used, multiple day exams cannot be conducted. How to practice exams on new software? PrepLadder being the first platform to adapt to the change will move all its tests to the new TCS software. The shift will be made at midnight tonight. *This will probably be the official scoring process for NBE exams this year. 1. Your score on all previous exams will be updated according to the new scoring process. 2. You will lose progress on any exam you paused in between, so please complete all in complete exams before midnight tonight. PrepLadder students will not be affected by the change, you have enough time to practice on the new software so that you face no problems/surprises in the real exam.